Have Sport, Will Travel. This Time. FullPlateDad (FPD) and I have spent a parenting lifetime avoiding club sports, sometimes to the chagrin of our children. AJ, our 14-year-old son from Ghana, is very sad to never have participated in the highest level of soccer achievable. We put him on the mid-level, non-traveling team, on scholarship. When he asked why we wouldn’t apply for the scholarship for a higher level, we told him we didn’t personally agree with the culture of that particular club, it didn’t feel very diverse, and we weren’t going to spend our hard earned dollars traveling all over the Midwest for one child. Ultimately, he understood. When we do participate in a sport, we try to get multiple kids involved in it. Everyone is on the swim team. 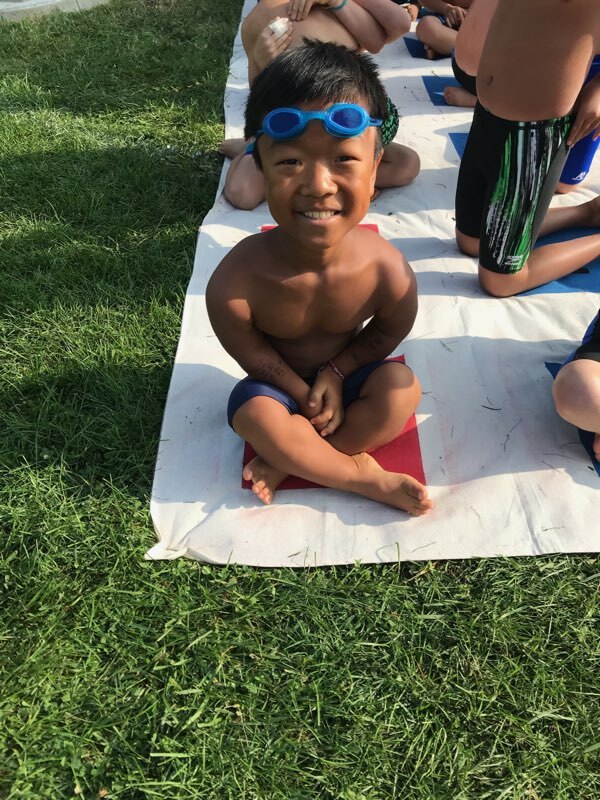 Even if they choose not to compete, we have them get in the water for practices so they learn good habits when it comes to exercise. We choose sports where individual times are measured, but there is a team atmosphere. We tell the kids we don’t expect anything of them other than improvement in their own performance. Ally runs cross country, as does Cam. Ally will never win anything. Sometimes, she is close to last one in from the course. Cam wins quite a bit. He narrowly missed making Varsity his Freshmen year. He did letter in both swimming and track. Ally won’t have a letter. I am so proud of Ally. I am so proud of Cam. They are both working to their fullest potential. Then Bowen entered our lives. He loves sports. He loves them the way Cam loves them, the way you love them when you have that innate drive to WIN, and I mean WIN with capital letters. He wants to get out there and blow away they competition. His predicted adult height is 4 feet tall. Bowen has Achondroplasia, the most common form of Dwarfism. 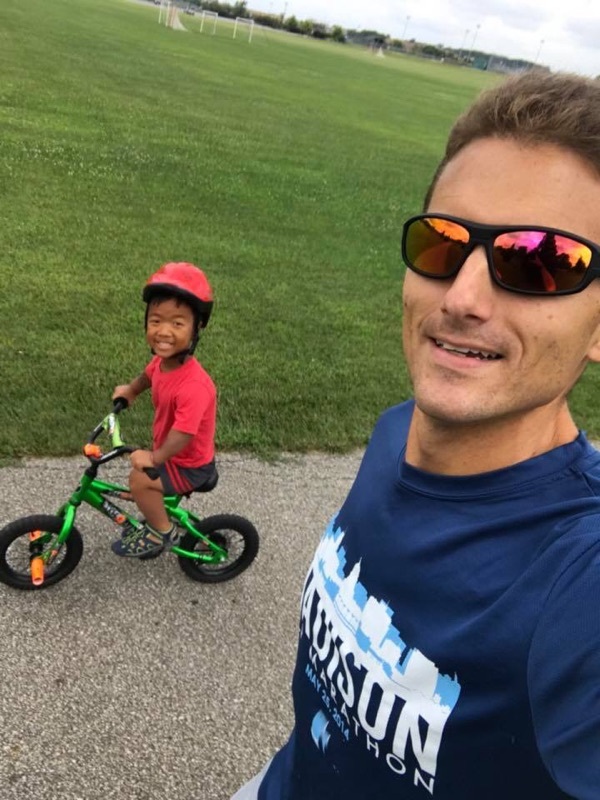 His head and torso are average-sized, but his arms and legs are short, approximately half the size of other kids his age. As you might imagine, this makes truly competing in any sports very difficult. It makes winning anything nearly impossible. Swimming is an excellent sport for Bo. It puts very little wear and tear on his joints. He gets to be part of a team, and he has individual times to help him measure his own performance. 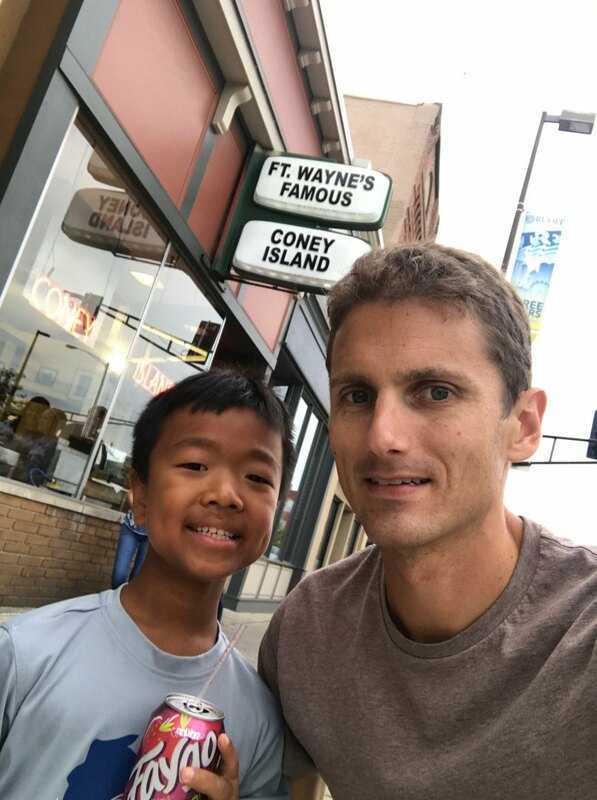 When he’s participating with average height kids, we make sure he understands that the only win or loss comes with a time drop on his own personal best. He understands and embraces that. It took Bowen a very long time to even learn to swim. We put our other kids in the water as soon as they got to us, swam year round and most had mastered it within a year or by the time they were 5-years-old. That wasn’t the case for Bo, and largely, that wasn’t his fault. People are taught to swim by people who have been taught to teach average height children to swim. Bowen has to balance his short arms and legs against the weight of his head and torso. He had to learn how to accommodate for that. Accommodations like that can’t really be taught, it just takes time and getting comfortable in the water. Two summers ago, it began to click. We put him on our summer team, and he made his big swim. Last year he swam year round, on a summer swim team and over the winter with a club on a scholarship. Our winter club held a Paralympic swim clinic for athletes with disabilities and Bo got to meet a Paralympian. He got to touch Paralympic gold and it was decided in his mind, that was his goal. So, this summer we took him to a local qualifying event. We had looked at the time standards and thought he stood a good chance of qualifying. At the beginning of this week, Bo and FPD traveled to Fort Wayne, Indiana for Paralympic Junior Nationals. We traveled 5 hours to get him there. We wouldn’t do that for any other kid in our family. There wasn’t one word about why Bo got this and the others didn’t. There wasn’t one bit of whining. 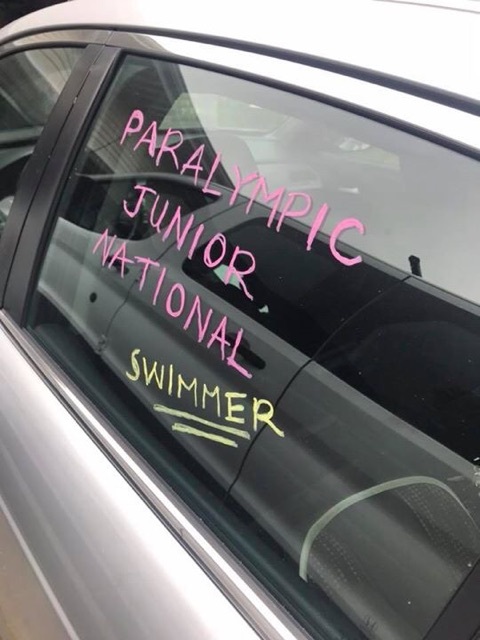 Instead, we painted the windows on the car to make him feel so special, to let him know that this is what matters, doing your best on that level playing field. In our pajamas, in the wee hours of the morning, the driveway was filled with FullPlateKids waving to the retreating silhouette of a sedan containing one very excited 8-year-old. He brought home some major hardware. Two golds, two silvers, and a broken record. Yes, our Bo broke a record at U.S. Paralympic Junior Nationals in short course swimming. We couldn’t be more proud of him as an athlete. –FullPlateMom, who can’t wait to see where his next competition takes us.